We've been having our annual 2 week holiday at the Jersey Shore - spending two weeks with our family - parents, spouses, siblings, kids. It's our third annual family vacation and the second time staying in the same house as last year - with an additional week added for a more leisurely holiday. I've not been able to do much of anything, as I have a bum leg. I hurt it a few weeks ago and I can't bike or even walk very far. Mostly we've/I've been laying about, heading to the beach, relaxing, enjoying the down time. After spending several years in the same beach town of Sea Isle/Strathmere (we've usually stayed at the end of Sea Isle that abuts Strathmere) it's nice to call our annual vacation a family tradition. My whole life of vacationing "downashore" in Philadelphia-speak has enabled me to take in the joys and quirks of almost all the South Jersey Beaches. As a child, I spent the summers in Atlantic City - in a time before the casinos and all the desperation enveloped the town. I have stardust memories of The Boardwalk in Atlantic City and my memories of those years in the 1970's are Peaches and Cream-filled. As a pre-teen and teenager, I summered in Wildwood (aka, Childwood, or DooWop City). 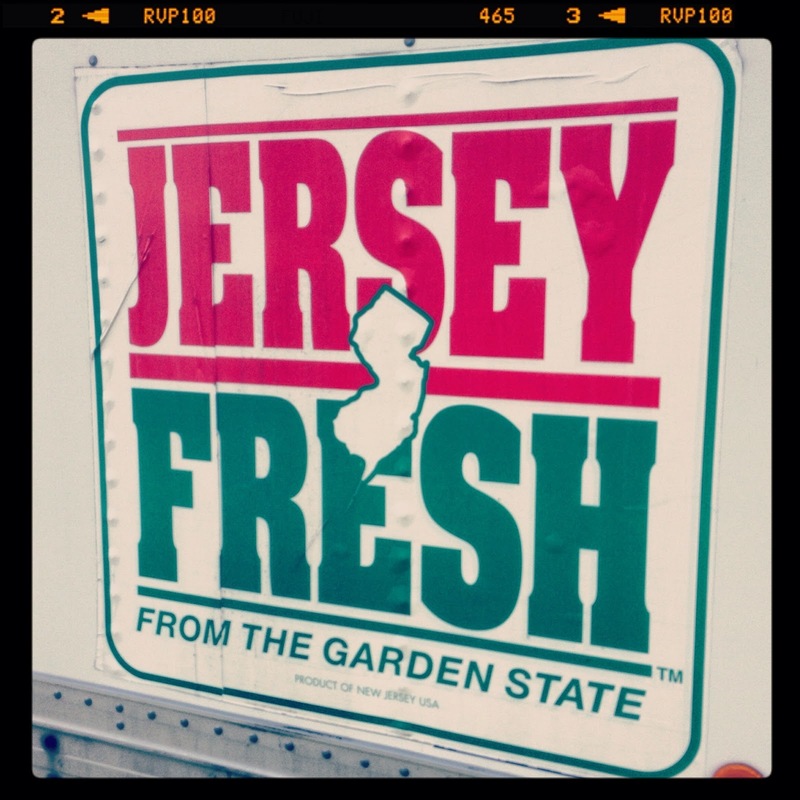 When times were flush, we went to Cape May. In my adult years, late 20's through my 30's, Ocean City became the defacto place to go. 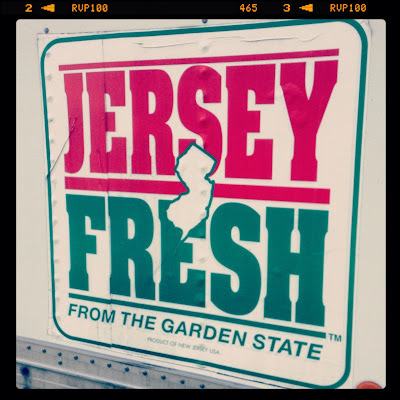 The family friendly town with it's five-mile long boardwalk and famous Manco and Manco Pizzas (it'll always be Mack and Manco's to me), Kohr Bros. Ice Creams, and Johnson's Popcorn shops on every block were de riguer eating pastimes. I camped with a friend's family in a camp ground outside of Sea Isle. The only places I really never visited were Avalon and Stone Harbor - haughty places not akin to day trippers. So, after 40 plus years of wandering up and down the Route 9 coastal highway, I thoroughly enjoy calling the Sea Isle and Strathmere beaches ours. Especially Strathmere, the secret gem of this area. Shhh! You're in Strathmere - a mile long throw-back town that feels more like Nantucket than the Jersey Shore. I thought I'd explore more food finds and discover or rediscover the best of the area. As I said, I'm not physically able to do much, but we have visited the local farmers' markets both weeks that we've been at the beach. 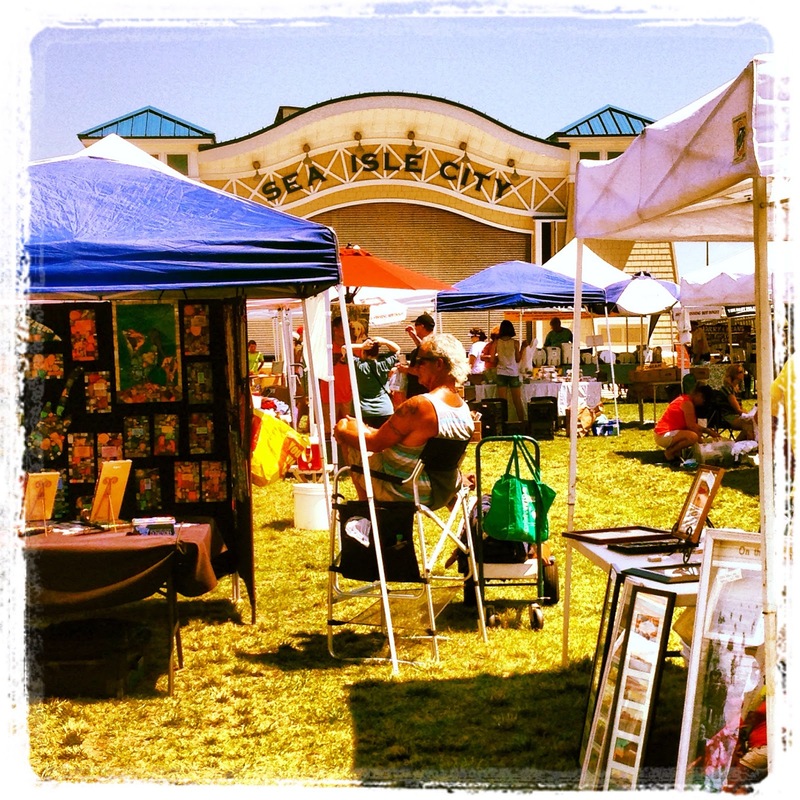 On Tuesdays, the Sea Isle Farmers' Market is held in the center of town, right alongside the tiny Sea Isle boardwalk. It's spread out on the lawn area this year, having grown enough that they needed more room than the parking lot it took over last year. I like the new layout - the market is now on the lawn area where they hold concerts, baby parades, movie night and other weekly events. The market is a combination of local farmers, bakeries, jelly, jam and honey purveyors, hot sauce hawkers, and crafters galore. It's not overwhelmingly large, but big enough to offer variety and a nice way to shop for an hour or so. Many of the farmers who come to the Sea Isle market also sell at other markets in the area, as well as have outposts in the Philadelphia area. I recognized Buzbys Farms from Collingswood and Philadelphia. My favorite finds of the Sea Isle market were the delicious breads I bought from a bakery out of Atlantic City - great rustic loaves of round breads and very good long Italian loaves. There were also delicious muffins and pies. 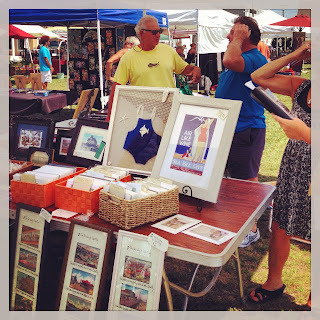 Non-food related - was a vendor selling antique postcards of Shore Days gone by. He had framed original post cards, framed so you could see the front and back of the cards, along with vintage 1920's bathing suits. I bought a few reproduction cards of the Strathmere area - since that's the shore town we now call our summer home. 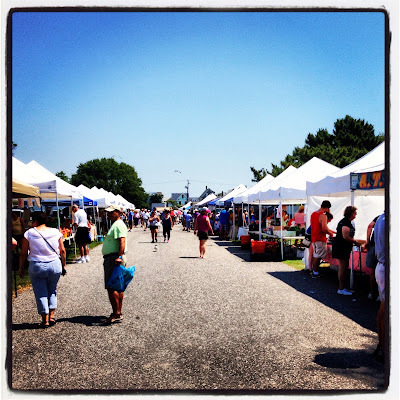 On Wednesdays, the Ocean City Farmers' Market is in full swing. This is at least the 4th year I've headed over to this market. I like it a lot and I'm delighted to see how big and strong it's grown. Last year they added a separate area for crafters and non-food vendors. I was happy to see that is still the case, with more vendors in each arena. There weren't too many outstanding or new finds, but the great people we met last year were there again. 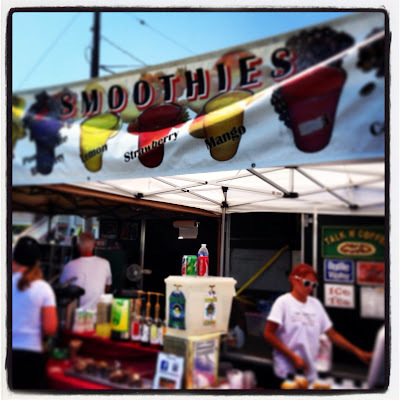 Momma's Home-Made Applesauce; Tony Baloney's of Atlantic City and his amazingly good pizzas and foccacias; Talk-n-Coffee and their SUPPER Smoothies; Gilda's Biscotti, and my Facebook Friend, Cat Gleason, of Pie Girl fame. I made a bee-line for The Pie Girl's stand. We caught up, chatted and shared a few stories about our past year and accomplishments. We also picked up a few pies for dessert. Pie Girl had a nice write up in the Philadelphia Inquirer about her super venture. Delighted to be a follower and fan of her successes and good works. 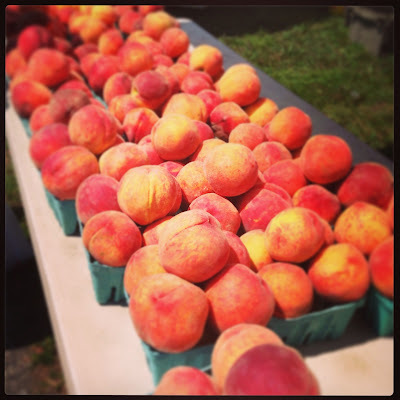 Peaches were in abundance, as well as great Jersey Blueberries. I wish I could say we've been eating fistfuls of this luscious fruit, but alas, I've been too busy stuffing my face with ice creams and other shore treats. I have eaten some peaches and blueberries, but not as much as I could and should. 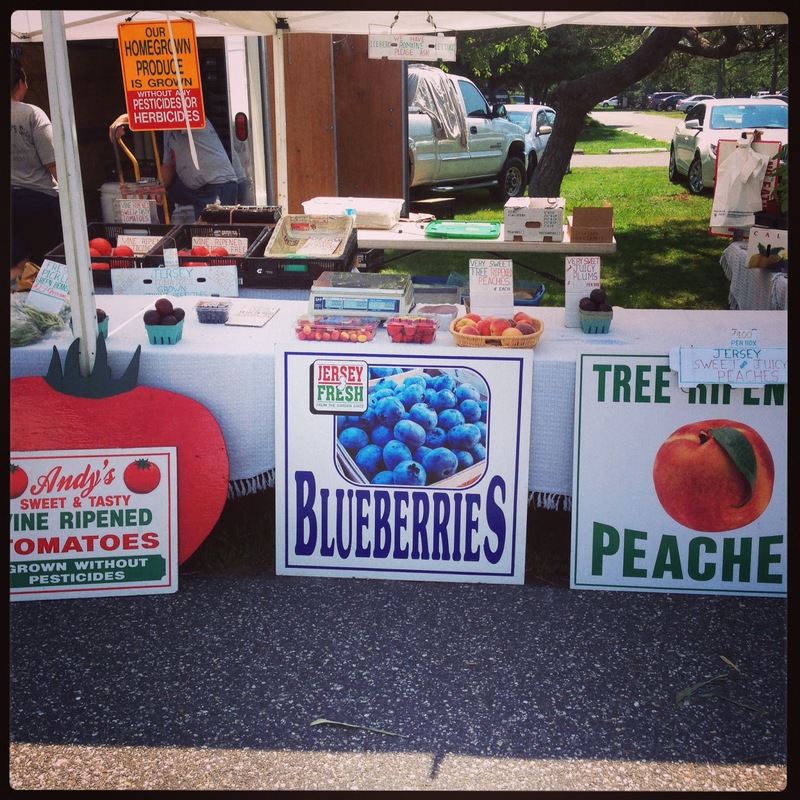 I'll do better once I get home and shop at the Collingswood Farmers' Market. Hopefully I'll be able to buy huge quantities of all the above and start canning in earnest! 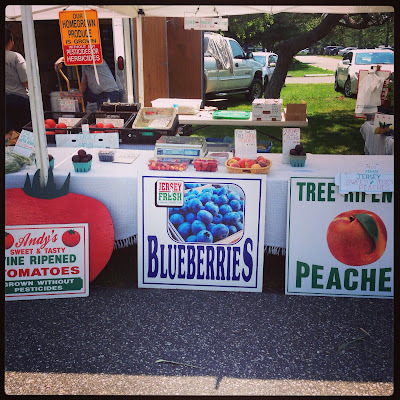 Looking at this photo gives me an idea to add blueberries to my summer salsas and canned goods! The last, but not least, other great food find of both markets, is Hank's Sauce of Sea Isle. 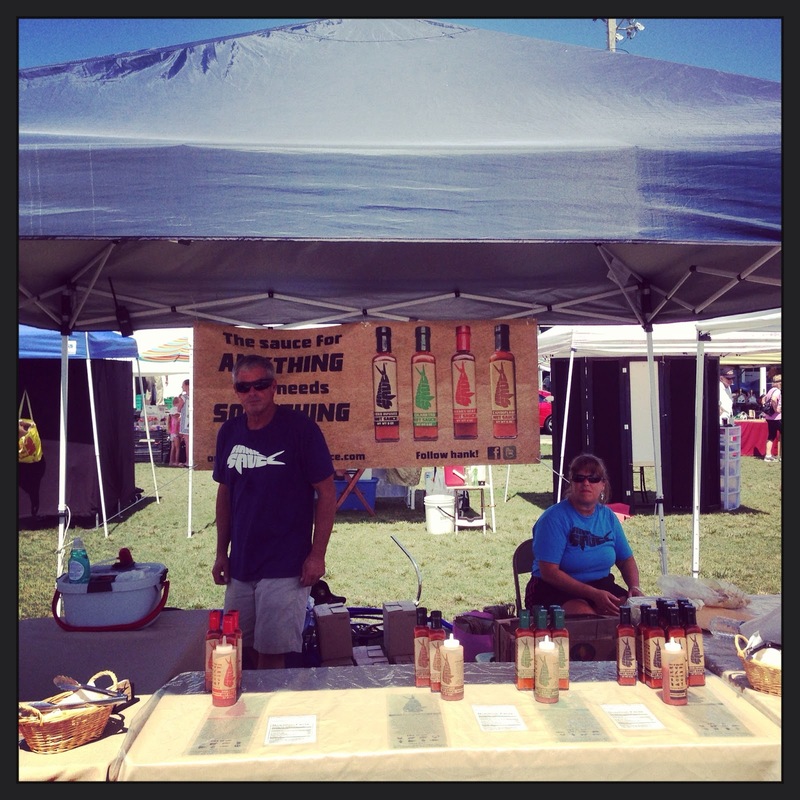 Our brother, Matt, found the store down around 86th Street in Sea Isle, last year. He bought a sampler pack of hot sauces and has been raving for the past year about how good this stuff is. We attempted to get lunch at the store on Monday, but the store is only open, Thursday through Sunday. I may have missed lunch but I was still able to buy the sauces. 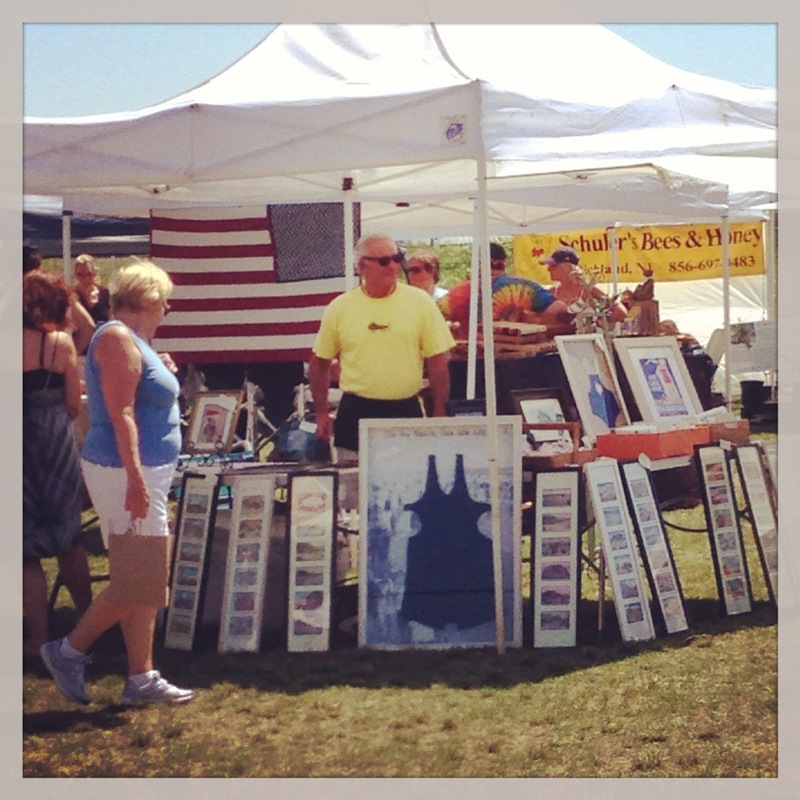 Hanks' parents have set up shop at both the Sea Isle and Ocean City Farmers' Markets. Hot sauces so good you can drink 'em up and dose nearly all your food with them for a zippy kick. I'm not sure I'll get to the shop for their tacos or burgers, but I did grab a bottle of cilantro hot sauce for cooking at The Top Gun Abode. With a day and half left to fill here, I'm not sure I'll find too many other notable eatables, but the point of this year's vacation is to relax. And that, I've done very well this year!